"Kirksville" redirects here. For other uses, see Kirksville (disambiguation). Kirksville is a city in and the county seat of Adair County, Missouri, United States. Located in the Benton Township, its population was 17,505 at the 2010 census. Kirksville is home to two colleges: Truman State University and A.T. Still University. Kirksville was laid out in 1841 on a 40-acre (0.06 sq mi; 16.19 ha) site, and was first incorporated in 1857. According to tradition, Jesse Kirk, Kirksville's first postmaster, shared a dinner of turkey and whiskey with surveyors working in the area on the condition that they would name the town after him. Not only the first postmaster, Kirk was also the first to own a hotel and a tavern in Kirksville. Contrary to popular belief, the name of the city has no connection to John Kirk, onetime president of Truman State University from 1899 to 1925. However, the grandson of Jesse Kirk reported that the town was named for Kirk's son John, a figure of local legend credited with killing two deer with a single bullet. "Hopkinsville" was explained as a joking reference to the peculiar gait of John Kirk's lame father-in-law, David Sloan; the jocular name was discarded when the village was selected for the seat of justice in Adair County. The Battle of Kirksville was fought August 6–9, 1862, during the American Civil War. Union troops led by John McNeil forced Confederate volunteers under Joseph Porter to vacate the city. Casualty estimates (almost entirely Confederate) range from 150-200 dead and up to 400 wounded. According to the August 12, 1862, Quincy Herald there were 8 Federal dead and 25 wounded. The victorious Union commander, Colonel McNeil, gained brief national attention for his post-battle execution of a small number of Confederate prisoners. These prisoners had been previously captured in battle and then paroled with the understanding they would no longer take up arms against the Union, upon penalty of death if recaptured. Nonetheless, Confederate government officials were outraged, and it is said that Confederate president Jefferson Davis even called for the execution of Colonel (later Brigadier General) McNeil if he were to be captured. On the evening of April 27, 1899, an F4 tornado passing through Adair County cut a path of destruction three blocks wide, killed 34 people and destroyed hundreds of buildings. The popular song "Just as the Storm Passed O'er" was based on the event, and the Kimball Piano Company exploited the incident for its advertising, when one of their instruments was carried a long distance by the tornado but still found in working condition. On May 13, 2009, Kirksville was again the victim of a large tornado. A tornado estimated as an EF2 on the Enhanced Fujita scale struck the northern edge of Kirksville destroying or severely damaging many homes, several businesses, a car dealership, and at least one factory. Two residents living just outside the city limits were killed by the tornado, and as many as a dozen other area residents were injured. The story and extensive video of the 2009 twister was featured in season 3, episode 4 of Storm Chasers on the Discovery Channel as well as a 2010 episode of Storm Stories on The Weather Channel. The Adair County Courthouse, Bear Creek Baptist Church, Dockery Hotel, Grim Building, Capt. Thomas C. Harris House, Journal Printing Company Building, Kirksville Courthouse Square Historic District, Drs. George and Blanche Laughlin House, Masonic Temple, Dr. E. Sanborn Smith House, Orie J. Smith Black and White Stock Farm Historic District, Sojourners Club, Thousand Hills State Park Petroglyphs Archeological Site, Travelers Hotel, and Trinity Episcopal Church are listed on the National Register of Historic Places. Kirksville is located at 40°11′41″N 92°35′00″W﻿ / ﻿40.19472°N 92.58333°W﻿ / 40.19472; -92.58333 (40.1947539, -92.5832496). According to the United States Census Bureau, the city has a total area of 14.43 square miles (37.37 km2), of which, 14.39 square miles (37.27 km2) is land and 0.04 square miles (0.10 km2) is water. Kirksville anchors a micropolitan area that comprises Adair and Schuyler counties. As of the census of 2010, there were 17,505 people, 6,714 households, and 3,066 families residing in the city. The population density was 1,216.5 inhabitants per square mile (469.7/km2). There were 7,434 housing units at an average density of 516.6 per square mile (199.5/km2). The racial makeup of the city was 92.3% White, 2.2% African American, 0.2% Native American, 2.4% Asian, 0.1% Pacific Islander, 0.8% from other races, and 2.0% from two or more races. Hispanic or Latino of any race were 2.7% of the population. There were 6,714 households of which 23.0% had children under the age of 18 living with them, 33.0% were married couples living together, 9.6% had a female householder with no husband present, 3.1% had a male householder with no wife present, and 54.3% were non-families. 37.8% of all households were made up of individuals and 11.1% had someone living alone who was 65 years of age or older. The average household size was 2.18 and the average family size was 2.90. The median age in the city was 23.8 years. 16.4% of residents were under the age of 18; 36% were between the ages of 18 and 24; 19% were from 25 to 44; 17.5% were from 45 to 64; and 11.2% were 65 years of age or older. The gender makeup of the city was 46.1% male and 53.9% female. According to the U.S. Census Bureau, the population on July 1, 2017 was estimated to be 17,536. As of the census of 2000, there were 16,988 people, 6,583 households, and 2,975 families residing in the city. The population density was 1,624.0 people per square mile (627.1/km²). There were 7,303 housing units at an average density of 698.2 per square mile (269.6/km²). The racial makeup of the city was 94.38% White, 1.73% African American, 0.26% Native American, 1.93% Asian, 0.04% Pacific Islander, 0.59% from other races, and 1.07% from two or more races. Hispanic or Latino of any race were 1.54% of the population. There were 6,583 households out of which 20.8% had children under the age of 18 living with them, 35.1% were married couples living together, 7.8% had a female householder with no husband present, and 54.8% were non-families. 36.9% of all households were made up of individuals and 11.6% had someone living alone who was 65 years of age or older. The average household size was 2.16 and the average family size was 2.83. In the city, the population was spread out with 15.6% under the age of 18, 37.6% from 18 to 24, 20.5% from 25 to 44, 14.4% from 45 to 64, and 12.0% who were 65 years of age or older. The median age was 23 years. For every 100 females, there were 82.5 males. For every 100 females age 18 and over, there were 78.5 males. The median income for a household in the city was $22,836, and the median income for a family was $36,772. Males had a median income of $26,776 versus $22,309 for females. The per capita income for the city was $14,388. About 14.4% of families and 30.6% of the population were below the poverty line, including 20.7% of those under age 18 and 13.1% of those age 65 or over. By 2015 a number of persons originating from the Democratic Republic of the Congo settled in Kirksville; they first came to the U.S. through diversity visas. 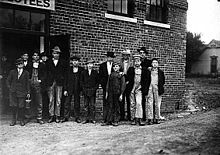 Many found work at a Farmland Foods facility in nearby Milan, Missouri. In 2014 five Congolese families lived in Kirksville. By February 2016 almost 40 Congolese families resided in Kirksville, totaling around 100 people. Prior to 2015 about half of the 20-25 English as a second language program students in the Kirksville R-III School District were of Hispanic origin, but the wave of Congolese students appeared by 2015, doubling the number of ESOL students and giving it a French-speaking population not previously present. Therefore, the district began expanding its ESOL program. Students and faculty from Truman State University took steps to help the Congolese residents acclimate to life in Kirksville. According to Dr. Sana Camara of Truman State, many of the immigrants were well-educated, and that the main barrier to success was specifically a lack of English knowledge. Kirksville is a Missouri Third-Class city, operating as a council-manager government. A paid city manager and staff handle the day-to-day operations and report to the city council. The city of Kirksville provides residents with full-time fire and police departments, along with water, sewer, and street maintenance service. Citywide trash removal is contracted by the city with a private contractor, currently Advanced Disposal Environmental Service, and is mandatory for all residents or property owners. Recycling is optional. The city of Kirksville partners with other agencies to operate Kirk-Tran, an area bus service, and a county-wide E-911 Center. Truman State University, originally the North Missouri Normal School and Commercial College, and more recently Northeast Missouri State University. A.T. Still University, home of the Kirksville College of Osteopathic Medicine, the founding osteopathic medical and dental schools. Moberly Area Community College (MACC) operates a Kirksville campus. Primary and secondary schools, including Kirksville High School, are operated by the Kirksville R-III School District. Paired with Ottumwa, Iowa, Kirksville is a media market region, ranked 199 by Nielsen, and home to two major stations: ABC/CBS affiliate KTVO 3, and Fox/NBC affiliate KYOU-TV 15. Kirksville is home to seven main radio stations. Radios in Kirksville can also pick up stations from Brookfield, Macon, Moberly, Hannibal-Quincy, and Keokuk, Iowa. Among low-powered translators and micro-broadcasters is 107.5 FM, operated by students from Truman's campus. In print, Kirksville is served by the Kirksville Daily Express, Sundays through Fridays, and on Thursdays by the Index, a weekly newspaper produced by students at Truman State University. The students of Truman State University also publish an alternative newspaper, The Monitor. Truman students produce a weekly news broadcast, News 36, played on CableOne channel 3 and on their on-campus station, TruTV, on Tuesday and Thursday at 5:30pm, 9:00pm, 10:00pm, and 2:00am. The City of Kirksville operates the Kirksville Regional Airport (formerly Clarence Cannon Airport), four miles (6 km) south of the city by the village of Millard. Kirksville, by way of La Plata, is serviced by Amtrak's Southwest Chief which runs along the BNSF Railway. The distance from Truman State University to La Plata (Amtrak station) is approximately 12.5 miles (20.1 km). Kirksville once had two operational railroads that ran through town. The east-west rail line was originally incorporated as the Quincy, Missouri & Pacific Railroad, which was renamed several times during financial restructuring and changing hands numerous times, until in 1897 it became the Quincy, Omaha & Kansas City Railroad. Financial problems continued, and it was operated by the Chicago, Burlington, and Quincy Railroad after 1903 and later absorbed by that company, which in turn became Burlington Northern in 1970. The portion of the line that ran west of Kirksville towards Green City was abandoned and eventually torn down in the early 1950s. The portion of the line that ran east of town towards Edina, Labelle, and West Quincy was scrapped in 1982 - 1983, after the Staggers Rail Act deregulated the rail industry. The depot which serviced along the Burlington Northern in Kirksville still stands along Elson Street just north of Cottonwood Street and plans are that it will be renovated. Kirksville's other railroad, the Wabash Railroad, became the Norfolk and Western Railway in October, 1964. This north-south line later became the Norfolk Southern Railway in 1982 after N&W merged with Southern Railway. In April 1992, the last official NS train ran the line between Albia, IA and Moberly, MO as the railroad announced it would abandon the line due to a loss in profit. During the summer of 1993, the railroad reopened to train traffic as the floods of the midwest affected lines around the Mississippi and Missouri rivers. Trains continued to run the line until 1995. After failed attempts from buyers wanting to purchase the line and turn it into a shortline railroad, work began on tearing down the railroad from Moberly, MO northward toward La Plata, MO where it has a connection with the BNSF Railway and from Moulton, IA southward toward La Plata, MO. The portion of the line from Moulton, IA northward towards Albia was purchased by the Appanoose County Community Railroad. In late September 1997, the tracks through Kirksville were finally torn out, leaving the city without a rail line. The project to tear out the abandoned line was completed by the end of 1997. In 1952, the United States Air Force opened a radar base that was home to the 790th Radar Squadron, an Aircraft Control and Warning Squadron, in Sublette, about 10 mi (16 km) north of Kirksville. The Air Force inactivated the 790th Radar Squadron in 1968. The Federal Aviation Administration took over running the radar and most of the surrounding 78.51 acres (317,700 m2) were given to Northeast Missouri State University. The current radar, an Air Route Surveillance Radar - Model 3, is a long-range radar that feeds data to air traffic control centers that control aircraft flying over the region. On May 6, 1935, a plane carrying Senator Bronson Cutting of New Mexico crashed south of Kirksville, killing him. As a result, Congress created the Civil Aeronautics Administration. On May 22, 1962, Continental Airlines Flight 11, heading to Kansas City from Chicago under heavy weather, was brought down by a dynamite explosion northwest of Kirksville. Some aviation historians consider this the first act of aviation terrorism in history. On October 20, 2004, Corporate Airlines Flight 5966 (now RegionsAir) crashed just south of Kirksville Regional Airport, killing 13 of 15 passengers and crew. On November 5, 2013, a Piper PA-32 crashed 3 miles southeast of Kirksville Regional Airport on its final approach, killing both passengers aboard. Kirksville is served by two watersheds. Hazel Creek Lake (530 acres), formed in 1982, was first used as a water source the next year. The larger water source, Forrest Lake (640 acres), was formed by the city in the 1950s when a dam was constructed across Big Creek. Forrest Lake anchors the Thousand Hills State Park, located just west of the city and is named in honor of former Missouri Governor Forrest Smith. Kirksville trash pick-up is currently conducted through the Advanced Disposal of Macon, MO. The company also picks up recycling and yard waste for the city. Most residents receive electrical service from AmerenUE, although a portion of the city receives it from Tri-County Electric, an R.E.C. co-op. Liberty Utilities is the natural gas supplier for the Kirksville area. Doris Akers, gospel singer and composer. Lewis Binford, prominent 20th century archaeologist and anthropologist; retired to Kirksville and died there in 2011. Anthony Cistaro, actor, born In Kirksville but grew up in California. Charles F. Cochran, U.S. Representative (1897–1905), born in Kirksville. Raised in Kansas. Alex Linder, White Supremacy leader and owner/operator of the Vanguard News Network, an antisemitic, white supremacist website launched in 2000. Rebecca Mark-Jusbasche, former head of Enron International. Jim Musick, American professional football player. James E. Rieger, US Army colonel & winner of the Distinguished Service Cross. Robert Taylor is another of several actors who lived in Kirksville. As a child he was here for a short period while his father Dr. Spangler Andrew Brugh attended Osteopath School. William Traylor, character actor and founder of the Loft Studio in Hollywood. Rhonda Vincent, Award-winning bluegrass singer. Arthur L. Willard, U.S. Navy Rear Admiral & winner of the Navy Cross. ^ a b c d e f "GNIS Detail - Kirksville". geonames.usgs.gov. Retrieved 3 April 2018. ^ a b "US Gazetteer files 2010". United States Census Bureau. Archived from the original on 14 July 2012. Retrieved 25 January 2013. ^ a b "American FactFinder". United States Census Bureau. Retrieved 25 January 2013. ^ "Population Estimates". United States Census Bureau. Archived from the original on 2013-06-17. Retrieved 2013-05-30. ^ Violette, E. M. (1911). History of Adair County. The Denslow History Company. p. 345. ^ Eaton, David Wolfe (1916). How Missouri Counties, Towns and Streams Were Named. The State Historical Society of Missouri. p. 201. ^ Grazulis, Thomas P. (1993). Significant tornadoes, 1680-1991: A Chronology and Analysis of Events. St. Johnsbury, Vermont: Environmental Films. p. 686. ISBN 1-879362-03-1. ^ "The Kirksville Cyclone in 1899". library.truman.edu. Retrieved 3 April 2018. ^ "Three killed in Northeast Missouri storms - WGEM.com: Quincy News, Weather, Sports, and Radio". WGEM.com. May 13, 2009. Archived from the original on 17 February 2012. Retrieved 25 January 2013. ^ "About The Show : Storm Chasers : Discovery Channel". Dsc.discovery.com. 2008-09-10. Retrieved 25 January 2013. ^ "National Register of Historic Places Listings". Weekly List of Actions Taken on Properties: 7/11/11 through 7/15/11. National Park Service. 2011-07-22. ^ "National Register of Historic Places Listings". Weekly List of Actions Taken on Properties: 3/10/14 through 3/14/14. National Park Service. 2014-03-21. ^ "Average Weather for Kirksville, MO - Temperature and Precipitation". Weather.com. Retrieved 25 January 2013. ^ Brown, Danielle (2015-12-14). "Kirksville R-III adapts in order to better integrate Congolese students". Kirksville Daily Express. p. 2. Retrieved 2016-08-16. ^ a b Moling, Troy (2015-04-30). "Out of Africa, into the Heartland". KTVO. Retrieved 2016-08-16. ^ a b Hoak, Ashley (2016-02-05). "Congolese families create new lives in Kirksville". KTVO. Retrieved 2016-08-16. ^ Brown, Danielle (2015-12-14). "Kirksville R-III adapts in order to better integrate Congolese students". Kirksville Daily Express. p. 1. Retrieved 2016-08-16. ^ "Truman event provides glimpse into lives of Congolese residents". Kirksville Daily Express. 2016-02-09. Retrieved 2016-08-16. ^ "Uncertain first steps for council - Kirksville, MO". Kirksville Daily Express. April 8, 2011. Archived from the original on September 30, 2011. Retrieved 25 January 2013. ^ "Kirksville Daily Express - Kirksville, MO: Local & World News, Sports & Entertainment in Kirksville, MO". Kirksville Daily Express. Retrieved 3 April 2018. ^ "Federal Facilities Section: Department of Defense Sites". Archived from the original on 2006-07-24. Retrieved 25 January 2013. ^ "Kirksville History: Whitney McFerron". Archived from the original on 2007-09-27. Retrieved 25 January 2013. ^ "Records of the Civil Aeronautics Board (CAB) - (Record Group 197)". Retrieved 25 January 2013. ^ "We Would Just Like to Say Thank You" (pdf). Retrieved 25 January 2013. ^ "A Book of Adair County History." Published by the Kirksville-Adair County Bicentennial Committee, 1976. ^ "William Traylor". IMDb. Retrieved 3 April 2018. 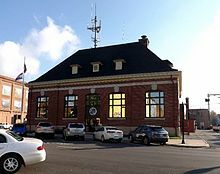 Wikimedia Commons has media related to Kirksville, Missouri.